Mutant sparkler Jubilee didn't ultimately appear in X-Men: Days of Future Past, but she was apparently considered as part of the superpowered line-up. 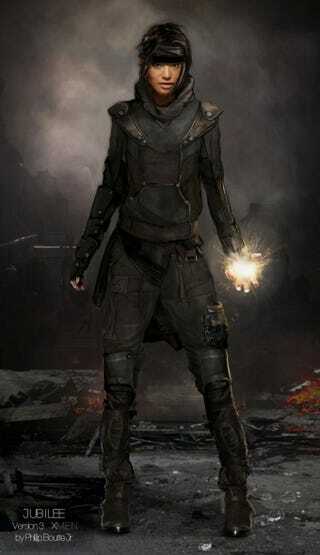 These concept images show her proposed dystopian duds. Costume illustrator Phillip Boutte Jr. has posted the images he made of a few of X-Men: Days of Future Past costume designer Louise Mingenbach's alternative X-outfits. There is no yellow coat for this version of Jubilee, it seems. Instead she could have been decked out in browns and greens.